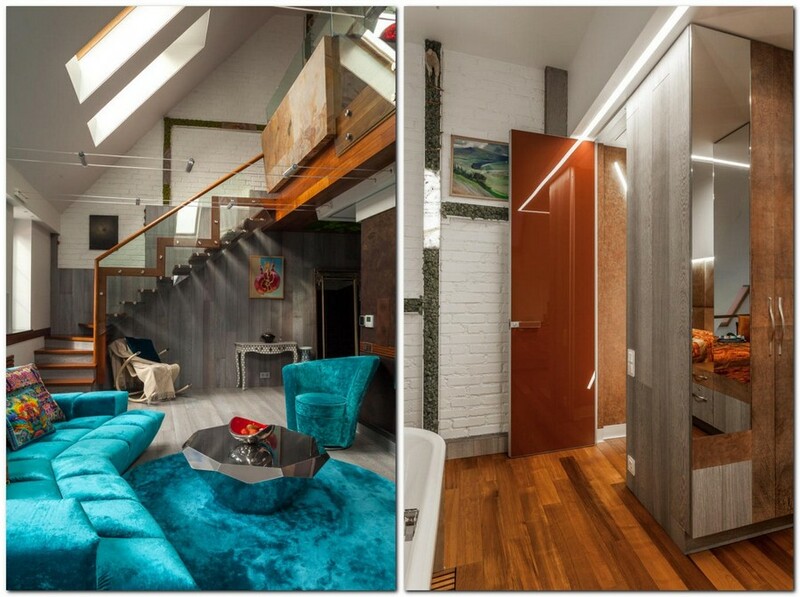 Peculiar features of this apartment start right from its color scheme. It is based on contrasting hues, three of which are prevailing. 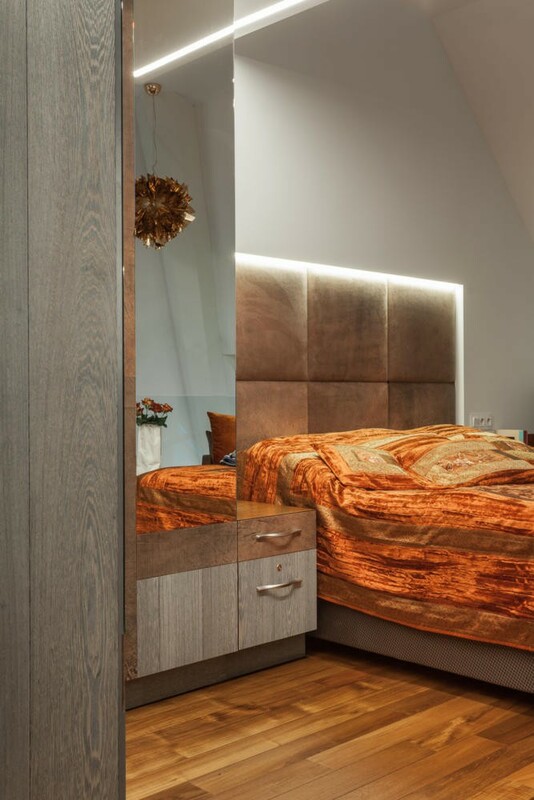 This is warm teak parquetry hue in the mezzanine, the choice of which was grounded by practical aspects: a wash basin and a bathtub are situated right in the bedroom. The second hue is grayish blue brushed wenge parquet on the first floor. And the third one is the upholstery of an emerald sofa by Bretz, which became the centerpiece of the first level. 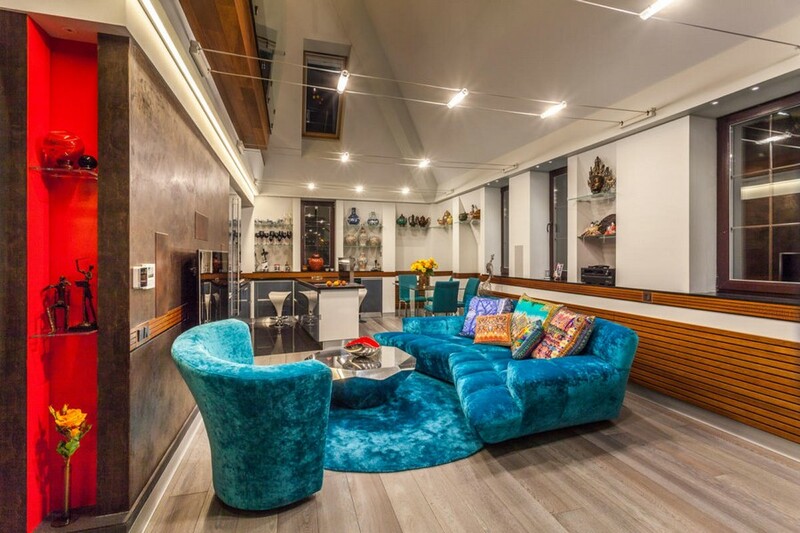 In general, this project is filled with seemingly non-combinable color combinations. But thanks to competent designer’s work with materials, forms and textures they complement each other and look pretty organic. 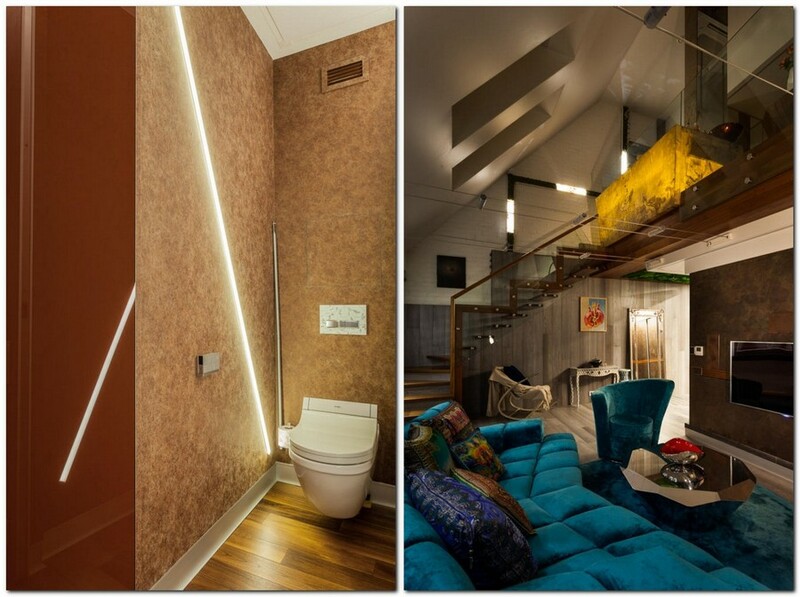 The choice of light fixtures was pre-determined by the attic’s configuration – most of them are LED profiles. There is also a chandelier in the mezzanine and cable lighting system above the lounge zone. The lounge zone is formed by a set of Bretz pieces – a sofa, a carpet and a coffee table. 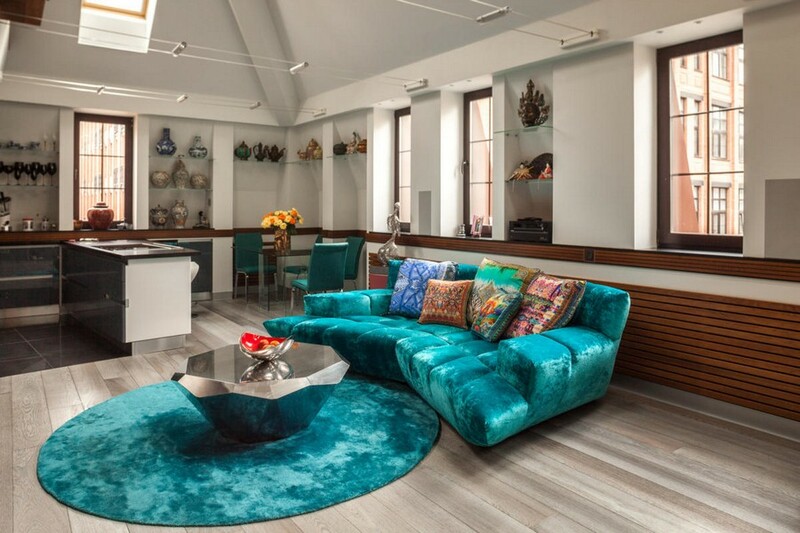 The sofa was picked with functional aspects in mind – the hostess wanted to have one extra sleeping place for a guest, but was dead against folding models. So this variant appeared to be ideal. 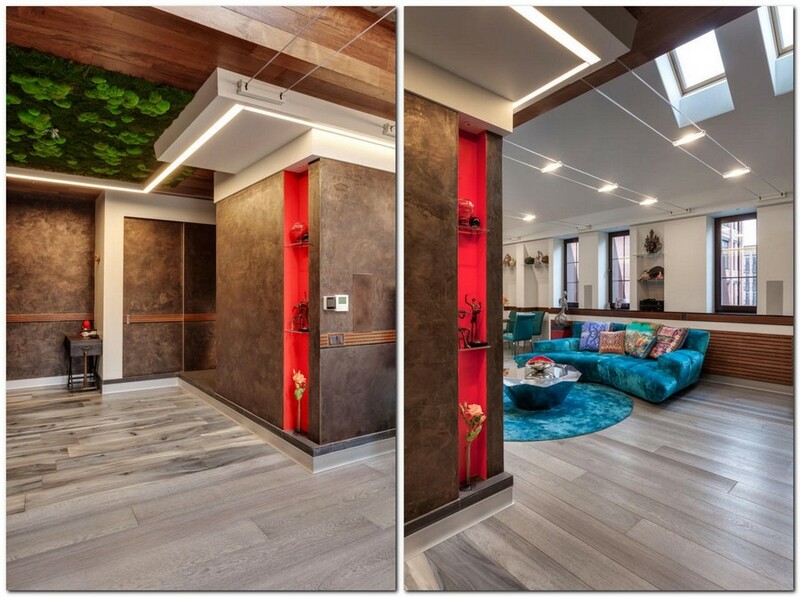 Besides, the client fell in love with its color and the architect wouldn’t mind. The wall with a TV-set is emphasized by textured paint Meteore 8. 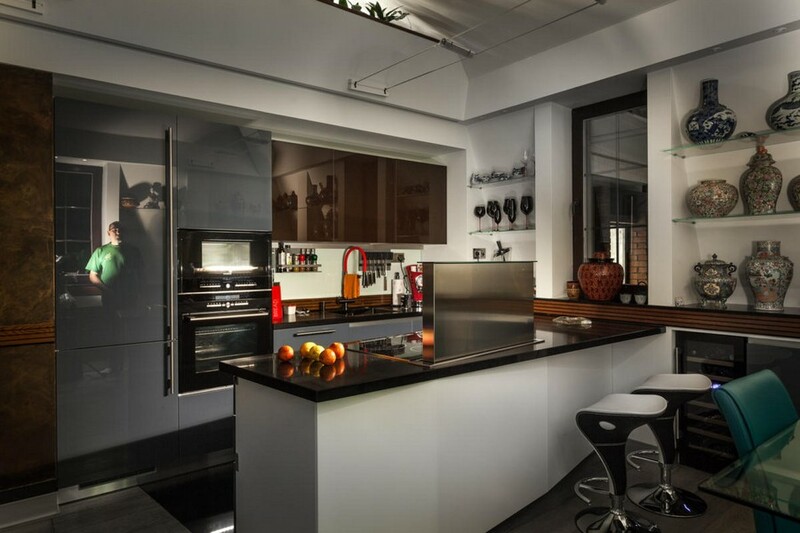 The kitchen zone is pretty laconic: plain glossy finishes do not draw over the attention from the lounge zone. 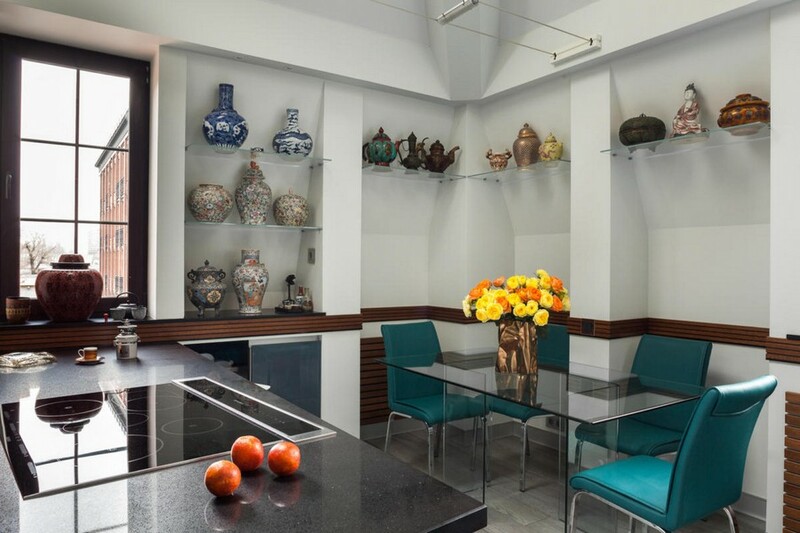 The preparation area is visually zoned by a compact kitchen island and dressed up with a few recessed shelves featuring a beautiful collection of glassware. 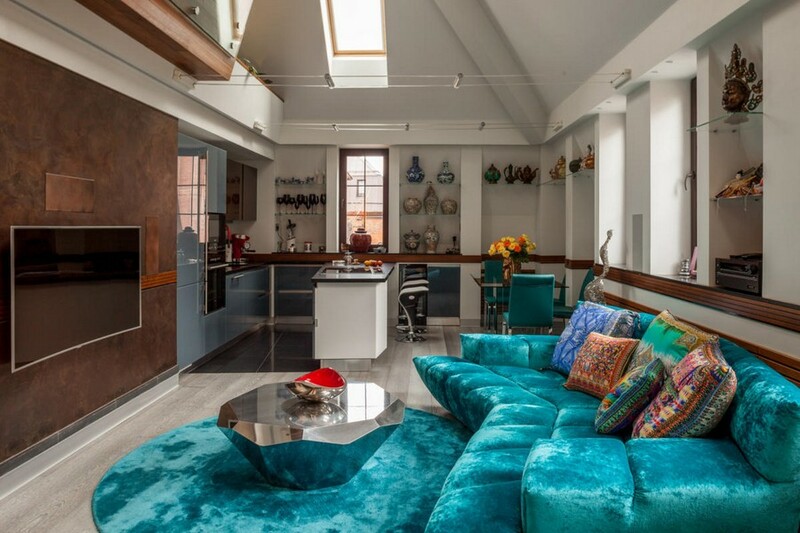 The dining area is composed of a light glass table and blue chairs matching the sofa upholstery. 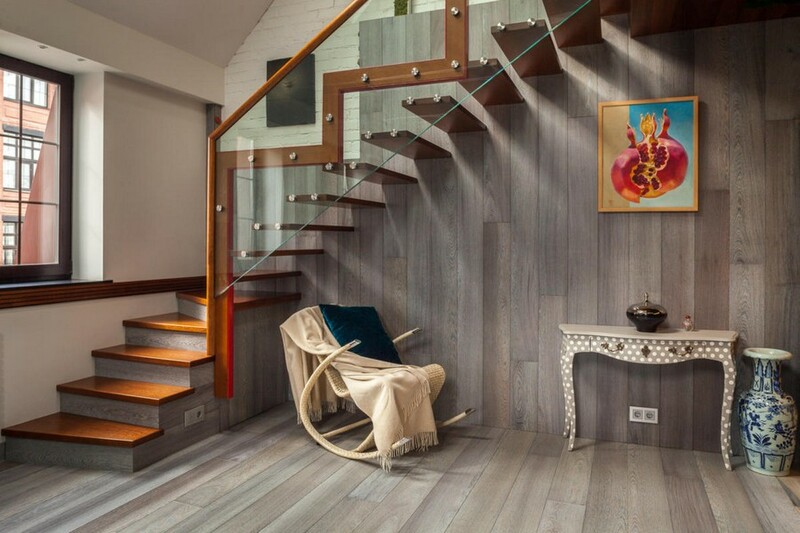 One of the designer’s favorite pieces of this attic is a staircase design in metal, wood and glass. But the element he is most proud of is the bathtub in the bedroom. 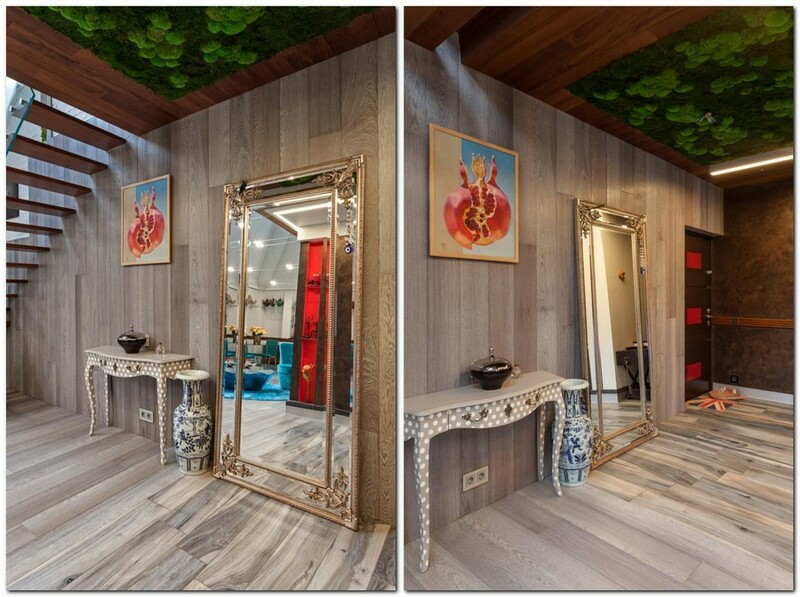 Just like the blue sofa is the centerpiece of the first level, the bath is the spice of the mezzanine. Its base is made of matte plastic faced with translucent Anjasora Flextone material and equipped with incorporated LED lights. This splendid art piece is coupled with a wash basin to match – it was acquired by the client from eBay and the manufacturer is unknown. Such non-trivial sanitary porcelain perfectly blends with a bed upholstered with natural leather. 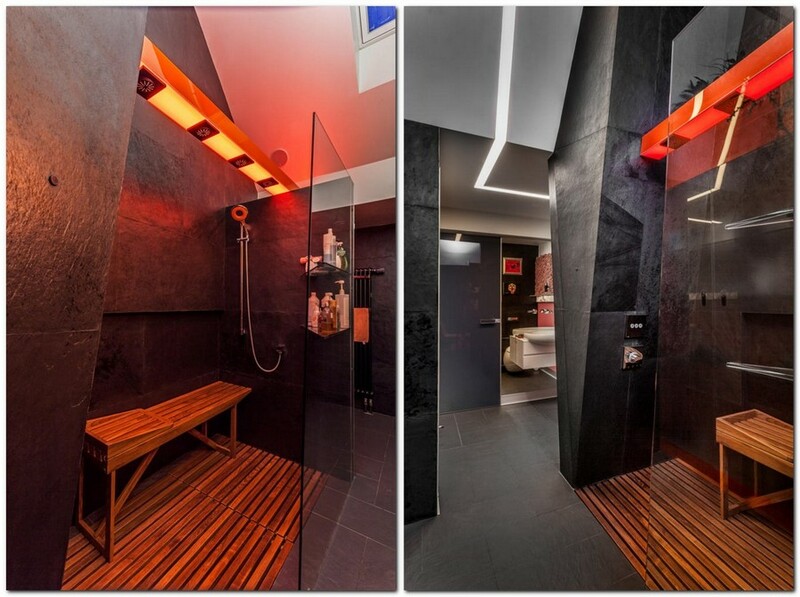 The shower is also unusual: designed in black and orange, it has a teak bench inside a glass cabin. 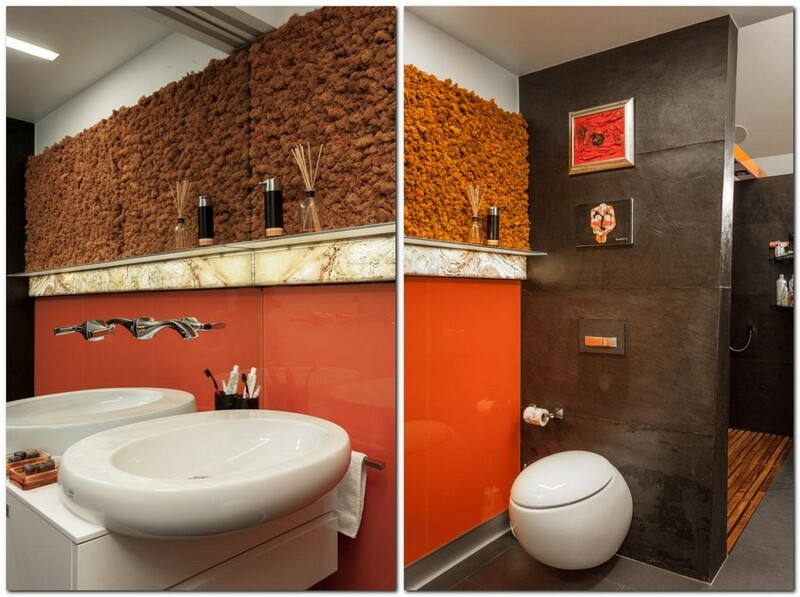 There is also a toilet bowl and a wash basin cabinet by Alessi One in this room. The ceiling is matte stretch. 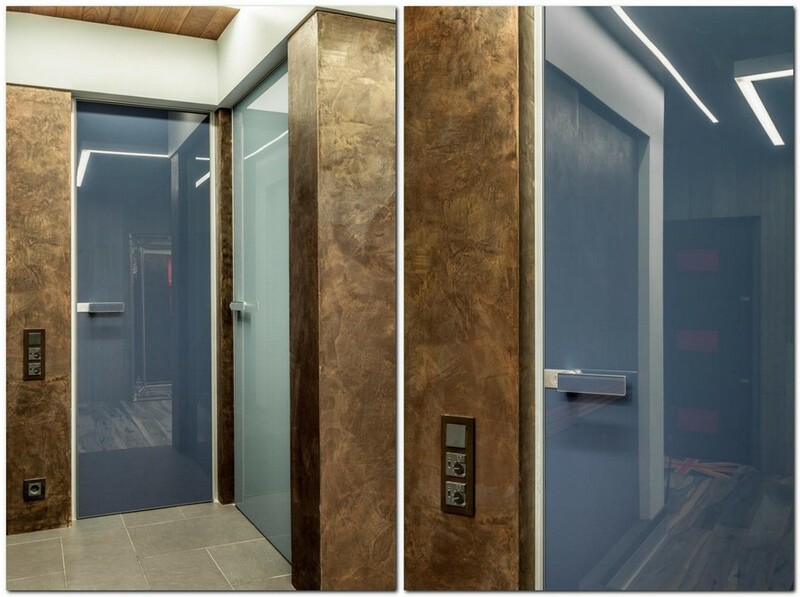 There are just three doors in this project (except for an entrance one), and all of them are faced with glass and have no architraves. The toilet door is as high as the ceiling, which is explained by the fact that there is a garret exit here. 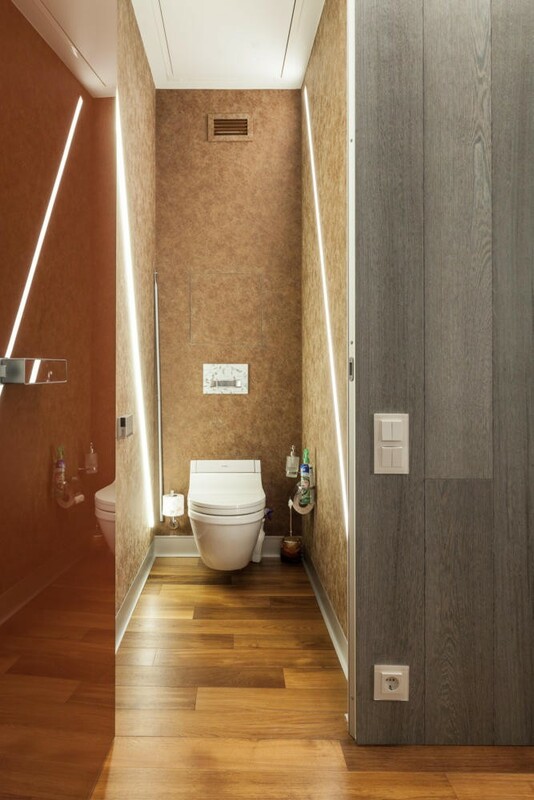 The toilet bowl is suspended (Duravit Stark ) and has a bidet seat by SensoWash.